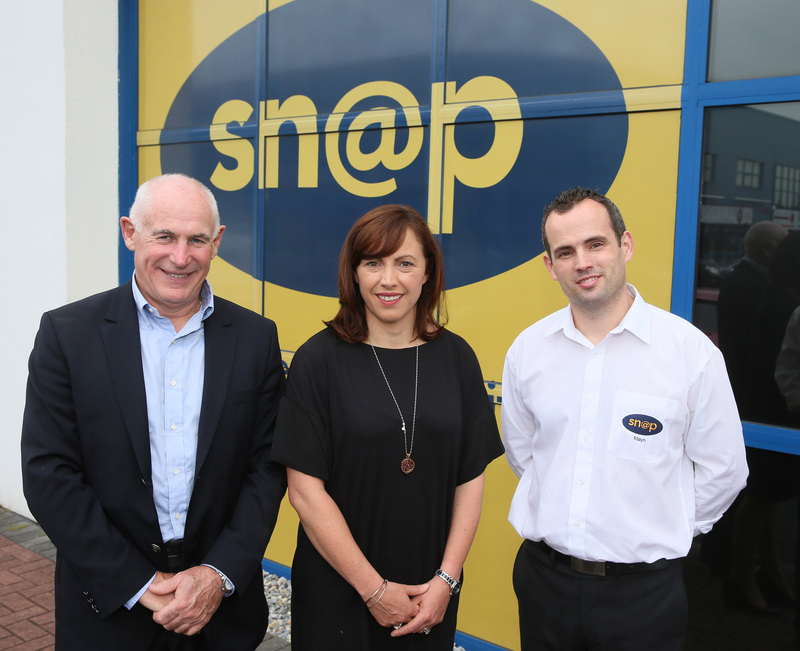 Michael Kearney (Director Snap Ireland), Sarah Flood (Owner Snap Mayo) and Kristian Sheridan (Centre Manager). Photo: Michael Donnelly. Irish Rugby National Team Manager Michael Kearney was guest speaker at Snap Mayo's event last Thursday (18th August 2016) celebrating their move to new premises, new branding and 10 years in business. The spacious new location in the N5 Business Park allowed them to showcase the offices, and particularly the impressive production area. Snap Mayo is a franchise of Snap Ireland which is entirely locally owned by Sarah Flood. She heads a team of ten employees from all over Mayo working in customer service, graphic design and production, providing a complete branding and marketing service to businesses all over the county and beyond. It's more than 30 years since Michael Kearney brought the Snap master franchise to Ireland from Australia and it has literally gone from strength to strength since, with 17 offices around the country. This year it was crowned Best Franchise System and Business Practice at the prestigious Irish Franchise Awards 2016. 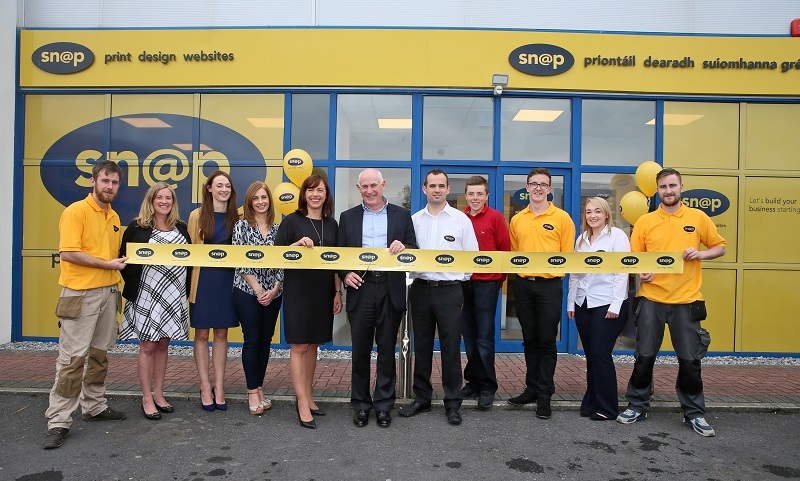 Michael Kearney (Director Snap Ireland) cuts the tape at the new Snap Mayo premises in the N5 Business Park. Eugene Molloy , Louise Grisley, Fiona Tierney, Sarah Flood (Owner Snap Mayo), Michael Kearney (Director Snap Ireland), Kristian Sheridan, Jason Potter, David Conway, Laurie Concannon and Stephen Howley. Photo: Michael Donnelly. The affable director of Snap Ireland was effusive in his praise for Sarah Flood and her team at Snap Mayo complimenting the new premises, saying it was the most impressive he had seen. Indeed it is a very attractive set-up, bright, spacious and very welcoming to visitors. The production area is much bigger than in the previous office, just next door. It needs to be, to accommodate the ever increasing types of print Snap Mayo offer. Everything from branded pens and bars of chocolate to pull-up stands, signage and attractive raised lettering come off the machines daily. Having everything onsite makes Snap Mayo particularly responsive to short timelines and gives them complete control of the finished product. Drawing on his vast experience in sport and particularly as Irish Rugby Team Manager, Michael Kearney noted some interesting parallels between sport and business, suggesting that the latter could learn from the former in some ways. "Joe Schmidt, Irish Rugby's Head Coach, is remarkably meticulous," said Michael Kearney, "After the recent tour of South Africa, every player in the squad received a two or three page personal performance review complete with relevant video links. He also puts huge emphasis on working as a team, and on striving to make your team mates look good at all times. Teamwork is an integral part of success, no matter what you are doing." That certainly makes a standard business appraisal fade into insignificance and shows how important attention to detail is in all aspects of life. "It's been a wonderful ten years in business here in Castlebar, and it's a pleasure to celebrate it with our guests", said Sarah Flood, owner of Snap Mayo, "I am fortunate to have an excellent, talented team of people working with me and they, along with our customers, are the main reason for our continued success."